After a full week of ministry in Puerto Cortes, Honduras we are excited to be offering a 2-night stay at a beautiful resort on Roatan Island for some much-needed R&R!. 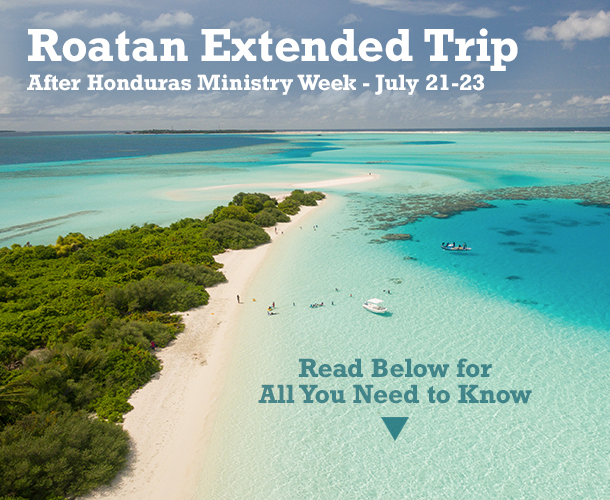 This excursion is an optional mini-vacation at the end of the Honduras Mission Trip (July 21-23). Roatan is known world-wide for its coastline that’s fringed by an astonishingly diverse coral reef teeming with tropical fish. On land, exquisite white-sand beaches and a beautiful scene of mountains and pine-forested hills blanket the landscape. The Trip Price Includes: Transport to/from the island, 3 quality meals each day and accommodations at a 4-star hotel with amenities and activities on-site. The hotel is situated right on the beach. Pools, jacuzzi, and beach volleyball. Nighttime entertainment including live music and cultural shows. Lounge chairs and beach towels at pool and beach. Complimentary WIFI in hotel rooms. Unlimited refreshing natural drinks and sodas with beach-side service. Our group will not be permitted to consume alcohol. Access to 4 restaurants, each with their own diverse menu. Dive lesson in hotel pool. Additional activities are available (e.g. snorkeling, jet ski rental, spa services, etc. ), but will be an additional expense that will need to be covered by you in country using cash or credit card. Full cost for the extended trip must be paid by February 1, 2019 (in addition to other payment deadlines) to secure your reservation. If you have an questions, please contact our office at (918) 266-5764.